Sunderland are close to signing former Hull striker Dame N'Doye on loan until the end of the season. The 30-year-old scored five times for Hull after signing last February before joining Turkish side Trabzonspor. Sunderland boss Sam Allardyce said: "I think he will bring goals. "He knows and has experienced the Premier League. Let's hope he can achieve the improvement we are looking for in terms of converting more chances and scoring goals." 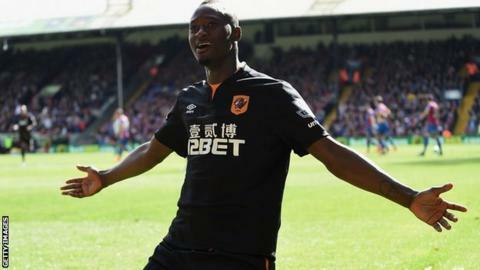 N'Doye was a deadline day signing for Hull 12 months ago and scored goals in wins over QPR, Aston Villa and Crystal Palace - but could not prevent the Tigers from relegation. He moved to Turkey last summer but has not scored in 12 appearances.